With Detroit’s annual rain/snow fall total in the dozens of inches, basement water is one of the leading causes of structural damage in homes in this area. This can lead to thousands of dollars in costly repairs and replacement of personal property. 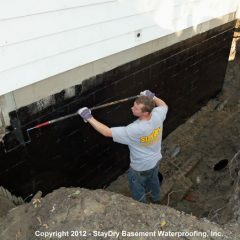 As Detroit’s leading basement waterproofing company, StayDry has 100+ years of dedicated service. We care about your home and property and will treat it like our own. Some of our services include: interior and exterior basement waterproofing, crack injection repair, foundation and crawl space repair, mold control and so many other services. We are so sure you’ll love our work, we offer a fully-transferrable 100% satisfaction guarantee on most of our services. Call us at 1-800-STAY-DRY for your obligation free consultation today! As Michigan’s largest city, Detroit has a rich history in automotive manufacturing. A lesser known fact is that Detroit gets hammered with precipitation year-round. This has lead to a number of floods over the history of the city. Many residents in the Detroit metropolitan area have decided to have their homes waterproofed to avoid the hazards of water damage. From mold and mildew to structural issues, water damage should be avoided at all costs. 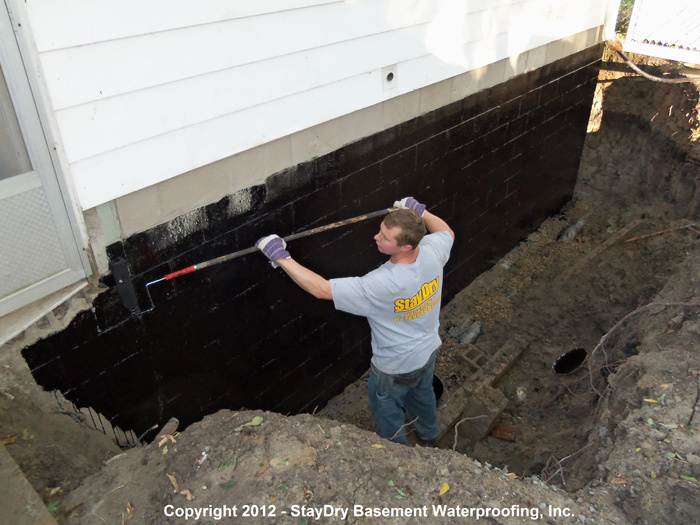 StayDry® provides Detroit basement waterproofing services, including: foundation repair, crack injection, sump pumps, and more! As mentioned above, the Great Lakes, as well as Lake St. Clair, have a major impact on the climate in Detroit. The lake effect causes summers to be abnormally humid with substantial rainfall. Winters, in comparison, are cold and filled with snowy days. In fact, Detroit averages more than 40 inches of snow every year! With this substantial amount of precipitation comes potential water damage to Detroit basements. Water damage can cause a basement to become the perfect breeding ground for mold and mildew, whose spores can cause health issues like asthma and even lung infections. Structural damage to the home is also a concern with water damage. 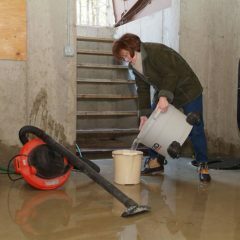 If your home is at greater risk of flooding, we also offer our exterior basement waterproofing services. This involves exposing the foundation of your home and covering it in a waterproof barrier. While this is more extensive, it is one of our more popular and effective services. “Water coming through my walls in the basement. We found a crack in the basement foundation that needs to be sealed. Also, there is mold on the floor and a couple inches up the wall in one room of the basement. Our house is built in 1906. One area in the basement is occasionally damp; a masonry wall running perpendicular to the foundation appears to be leaking water. The bricks appear to be spalling and some efflorescence. Need to stop the water and repair the masonry wall (if needed). I would like to waterproof my basement. The perimeter of the house has water leaking in because the sealing is old and cracked up. 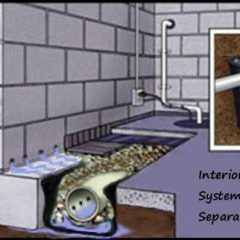 Weather and drainage systems are the most common basement problems for Detroit residents. With heavy rainfall in the spring and summer and snow in the winter, having a dependable drainage system in your home will save you from costly damage. Not only does basement waterproofing lead to savings, it can prevent illness. Water damage creates mold, which can lead to respiratory problems. If you have recently moved into a new home, or you have water in your basement and you don’t know how to fix it, read below for information about common basement problems and how to solve them. There are two kinds of basement cracks: vertical and horizontal. 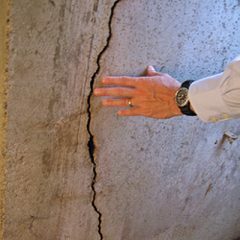 Verticals cracks are common, and they usually occur after a foundation settles. Horizontal cracks mean there might be something severely wrong with your foundation. 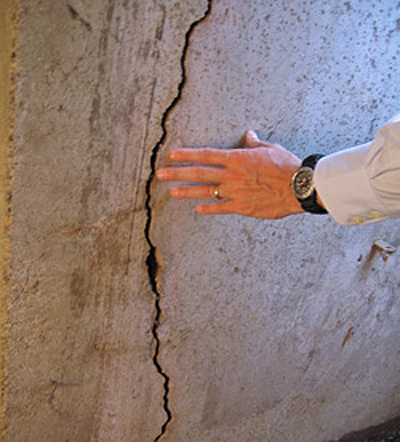 If there are cracks of any kind, call 800-800-7073 and a StayDry hero will give you an obligation-free consultation. Even though vertical cracks are common, water and melted snow will cause them to expand. With StayDry, concrete cracks don’t stand a chance. Our high-pressure polyurethane injection system will seal the crack and prevent water from leaking through. We are so confident in our crack injection system that we offer a lifetime guarantee. Unlike other low-pressure injections, StayDry service is built to last. We don’t cut corners, and we assure that each job only needs to happen once. 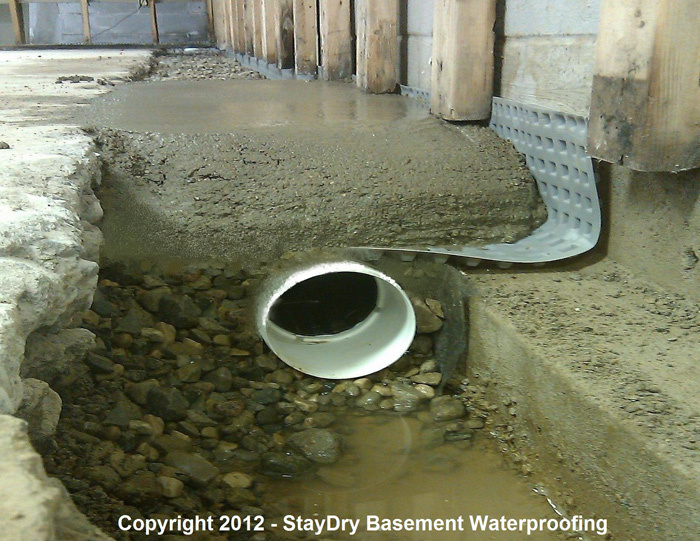 Call today and a waterproofing expert will arrive and seal your basement to any outside water. Detroit residents are familiar with the heavy year-round precipitation. 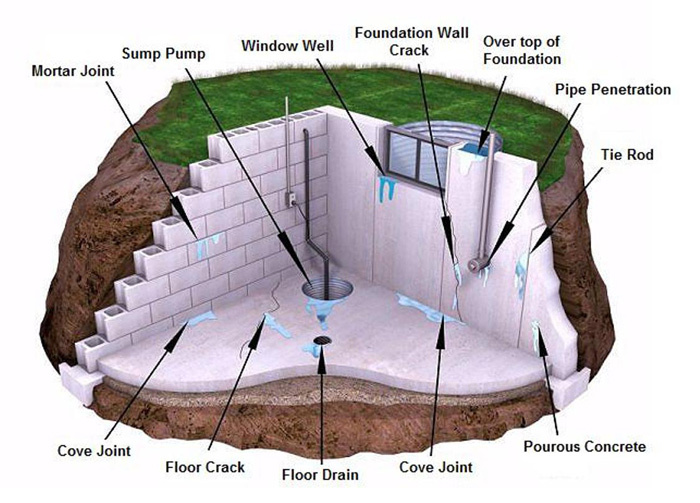 Water can cause the soil around your house to expand, resulting in foundation cracking. 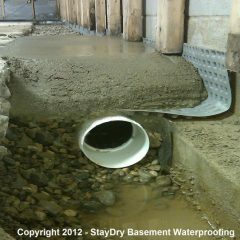 To prevent the expanding soil from affecting your house, StayDry will fortify your walls with our exterior basement waterproofing, and we will install French drains to make sure water moves away from your house. Your home is constantly exposed to the elements. 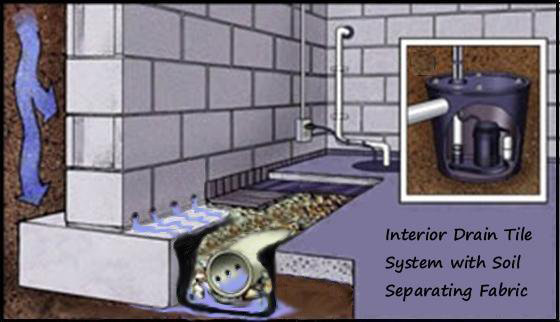 Having a proper drainage system is critical to ensuring that water doesn’t get inside. Taking precautions now and calling a StayDry agent can save you lots of money in the long run. It’s much easier to prevent water from entering your home than it is to remove it. Due to the heavy moisture around the Great Lakes, many Michigan homes come with sump pumps. However, a low-quality pump can stop working and result in a flooded basement. 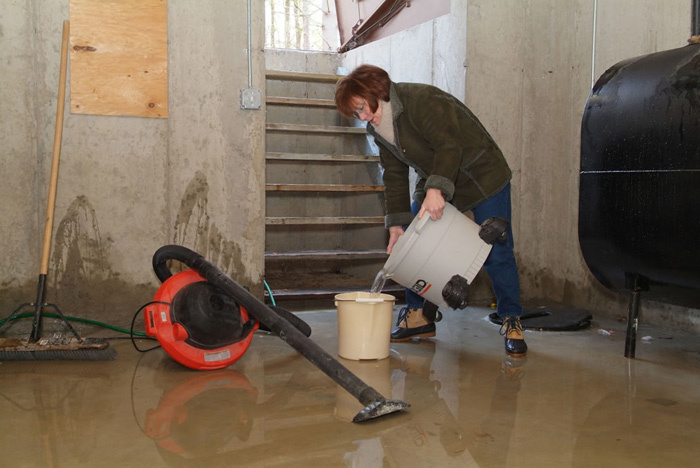 When it comes to keeping your basement dry, you need StayDry high-quality sump pumps. Since 2006, we have installed cast-iron pumps that are long-lasting and energy efficient. They are the best pumps in the industry, and they will keep your home dry during summer rains and snowmelt. For Detroit residents that want to make sure their basement stays dry over the weekend, we offer the deluxe PumpSpy. This addition product comes with an extra battery, a backup pump, and extra float sensors so homeowners can rest assured that their basement pump will not fail while they are away. Call 800-800-7073 for an installation today! As mentioned, Detroit homeowners should be well prepared in the event of a flood, especially considering the climate typical of the area. Basement floods can wreak havoc on your home, compromising its structural integrity, damaging possessions, and causing mold growth. 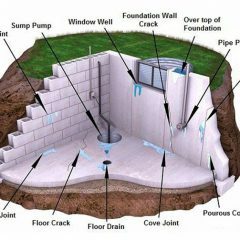 Each of these issues can present danger to your home and those living inside, which makes basement waterproofing in Detroit essential. Additionally, we back our interior waterproofing services with a lifetime warranty to ensure your home is protected when floods occur. Preventing damage is always easier than repairing it, so don’t hesitate to call today. If your Detroit home has not been waterproofed, we are here to help. Our experts are some of the best in the industry and we can help you choose the best Detroit basement waterproofing method for your home. You can contact us here or call us at 800-800-7073 for your free quote and consultation! Outstanding Job would recommend them!!!!!! From our first contact with the individual answering phones, to the owner and his colleague visiting our home, to the employee who came out for the repair - the customer service experience with StayDry is absolutely unmatched. Each point of contact was beyond friendly, and their team was more than accommodating to our pressing schedule despite them them being booked pretty solid. StayDry went above and beyond in all aspects of the service they provided, and it is no doubt a testament to the leadership and fact that all of their employees truly believe in the quality of work being performed. This is honestly my first Google review, and I can state with confidence that StayDry should absolutely be your first (and only) call.